The main purpose of a process landscape is to specify corporate processes that are directly involved in adding value to the company. If such processes are linked to each other as a sequence of functions, they form a process landscape. Process landscapes can be used to structure the process portfolio of a company. 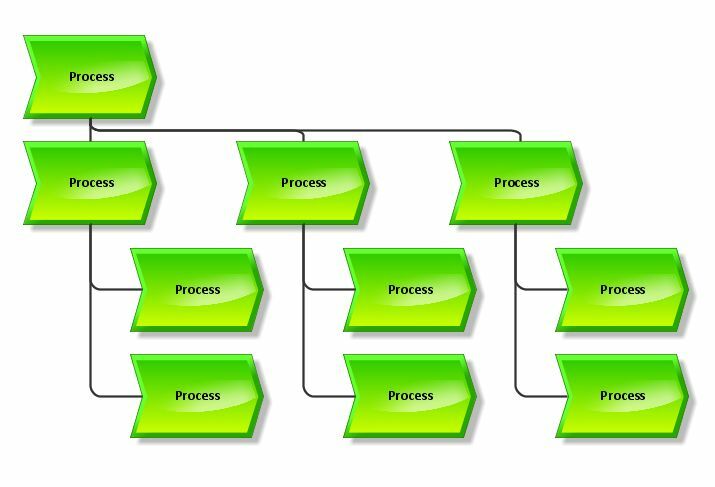 Within a process landscape processes can be arranged in a hierarchy so that certain process areas can be broken down into details. Management processes determine how the company is run. A typical example is defining corporate strategy. Core processes directly create value for a customer. For example, in a manufacturing company, the production process is a core process. Support processes are used by core processes. Typical examples are human resource management, IT management, and invoicing. Process landscapes help you gain an overview of the main processes in a company and their interdependencies. They enable all parties involved to better understand how the company works as a whole and how a specific work area fits in. how the company faces clients and suppliers. A process landscape is created using process objects and the „encompasses“ connection. This symbol represents a process that can be described, e.g., by using a “Business process” diagram. In the following example, a process landscape of the problem management hierarchy is shown. Using the interactive model viewer you can directly browse the process landscape displayed below. You can even download it and edit it in ARIS Express. You can also have a look at our video tutorials to find an easy way into the world of ARIS. Let's start modeling process landscapes!